Watch beautiful naat Ho Karam Sarkar ab to Ho gaye Gahme Beshumar Lyrics Video Naat by Awais Raza Qadri online on dailymotion youtube complete. 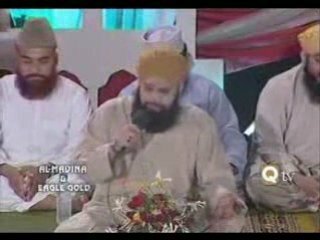 This is one of the best naat written and recited by Owais Raza Qadri sahib. He is my beloved naat khawan. The Soz and Gazad for Madeenah and sadness about our sins is so finely recited that I heard this naat sharif many time. Read lyrics of Ho Karam Sarkaar Ab Tu Hogai Gam Baishumaar by Awais Raza Qardi and watch full video. Jan-O-Dil Tum (PBUH) Par Fida, Ae 2 Jahan Kay Tajdaar (PBUH). App Hi Kuch Kijiye Na, Aie Shahe-Aali-Waqar (PBUH). Aur Lipatna Multazan Se Walihana Bar Bar. Chain Pata Deikh Kar Dil Mustajabo Mustajaar. Aur Safa Marwa Mujhey Behray Rasool-E-Zewaqar (PBUH)..
Mein Raha Jata Hoon Tanha Aie Habib-E-Kirdgar (PBUH). Hazari Ki Arzoo Nay Kar Diya Phir Beqarar . Yaad Aatay Hain Madinay Kay Mujhey Lailonahar. Yaad Aati Hai Bohat Ramadan E Taiba Ki Bahar. Kon Hai Jo Kay Sunay Teray (PBUH). Siwa Meri Pukaar. Dil Mera Ghamgeen Hai Aie Ghmzadoon Kay Ghamgusar (PBUH). Arz Kerna Rotay Rotay Ho Sakay To Bar Bar . Eik Baras Bhi Dekhta Agar Sabz Gunmbad Ki Bahar.